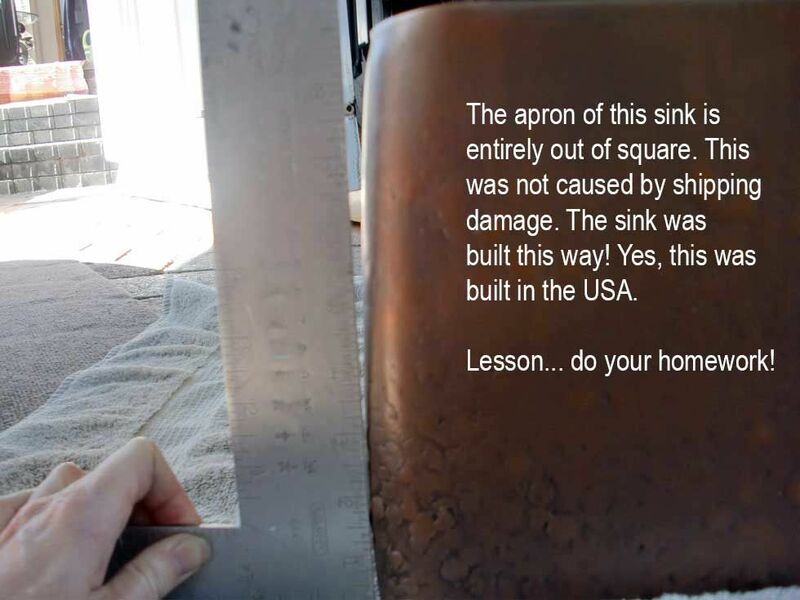 Most copper sinks are not made in the USA Learn about the differences. Do you really want a copper sink? You better do your homework if you do. This is what can happen if you don't do your homework! One would expect that a copper or stainless sink made in the USA would be a much higher quality than one made elsewhere. Sadly, that is not necessarily the case. Some US companies have recently entered the sink business after many years of making commercial copper products, gutters, sheet metal work, etc. 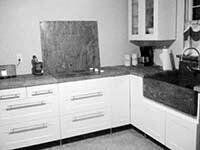 Making sinks is a very technical business requiring perfection and a thorough understanding of kitchen and cabinetry design. Don't be fooled by immitators. 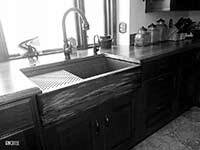 We are the original custom copper sink company and virtually all of the following ideas were originated by me. Workstation sinks as under mount, top mount and Apron front sinks - yes, I originated the first workstation sinks! A patented channel behind the apron to allow retrofitting a farmhouse sink in existing cabinets. In fact, I have about 10 patents on sink designs. I really hate to mention this, but the public needs to be informed when a company is hiding the truth. There is an American company has the audacity to put fake reviews on their Houzz.com profile. 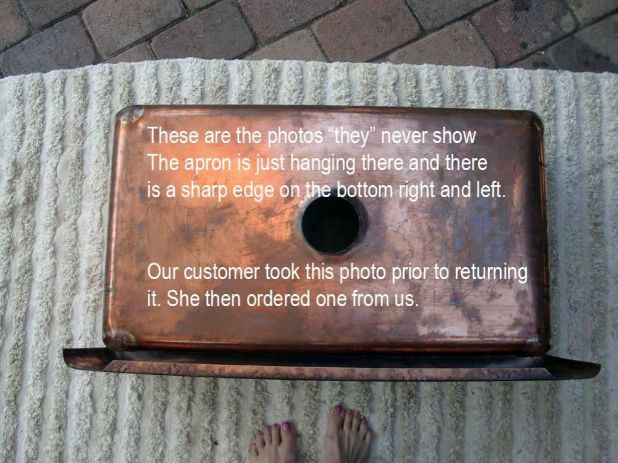 It appears they also photoshopped most of the patinas on their copper sink patina page. They also copied and paraphrased much of the information on my website. I suppose when one is desperate, one does things that are less than honorable. 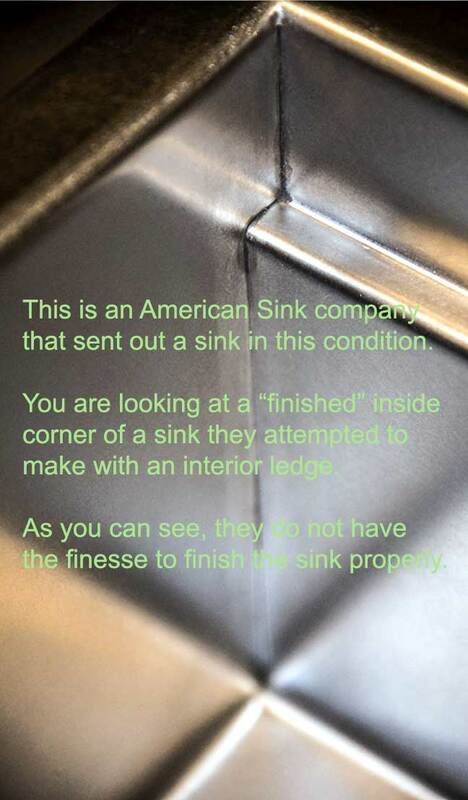 The photo to the left is their attempt at finishing a stainless sink without the properly skilled employees to do the finishing properly. The sink was sent back twice and the end result was only acceptable because they said it was the best they could offer. So how can you tell what to do? Is sink manufacturing their only business or is it a sideline? Do they also do sheet metal work, gutters, duct work, etc.? Ask how long their patina person has been working for them. Ask what would happen if there is an issue with the patina after installation. Ask if they have ever had problems, and how they dealt with them. Use your "gut" feeling about the company. Call them, speak to them. Do they seem desparate to make a sale? You will get a good feel by making a phone call. I would like to share an important story with you. 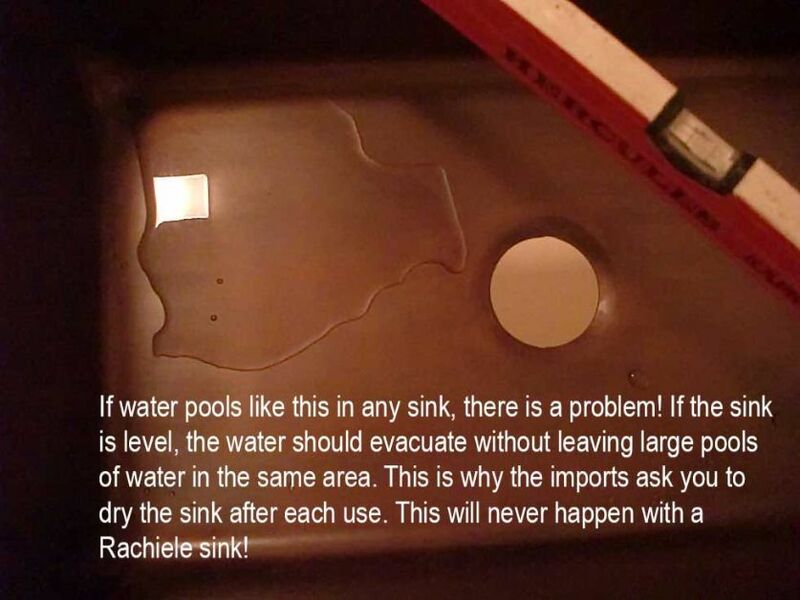 I received a phone call from a homeowner indicating she had received a copper sink from an American company. The sink was truly made in the US. She said the quality was so horrible, she could not even consider installing the sink. She shared with me that she truly did study several online companies (not ours) and decided that the company she chose was the best. They had a great web site, lots of information and seemed very nice on the phone. They touted themselves as copper experts. She said she thought she asked all the right questions. To date, they have been quite pleasant and have offered to fix the sink. She is somewhat hopeful that they will at least meet her halfway with the cost if she returns the sink. 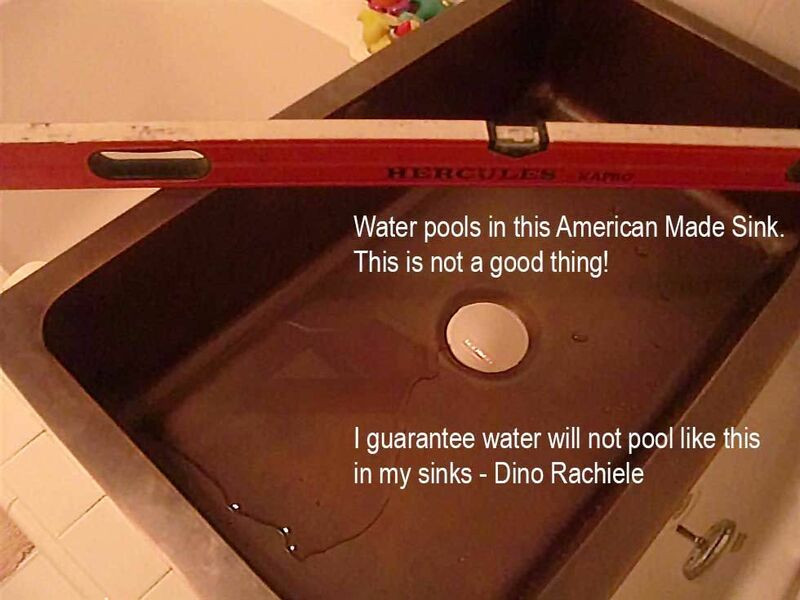 (Update: They have agreed to take back the sink and refund their money.) After discussing this with her, I realized that there are two questions that would have helped to weed this company out. Ask to see photos of the bottom of the sink. Then ask how long the warranty is for. 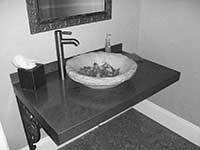 We clearly state we will gladly take back a sink if you are not THRILLED with the quality. We will pay all shipping costs as well. We will also send you a check for $100 in consideration of your inconvenience. (I would make it more than $100, but imagine there would be some folks that would order and return a sink just to make a quick $500) To date, we have never been asked! Also, our warranty is for life, not a year. Look for yourself. These are photos sent in by our customer. PLEASE do not ask who this company is, as I will not share that information. I merely want to point out that this sink was made in the USA and that you should do your homework! This photo shows the front left side of the apron - not even close to being straight. Make sure you click on this photo. Look at how the apron is made. YIPES! This is a close up of the drain area. They don't even know how to make a proper drain hole in a kitchen sink. Folks, please also ask how long the company has been making sinks as a primary business. We have been doing this full time since 1999. By the way, our first sink was 10 times as nice as this one!